Everyone loves these! 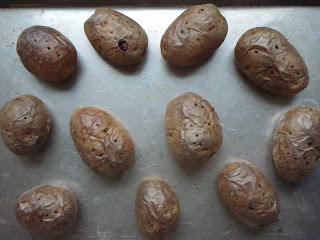 In this picture they have just come out of the oven after the first roasting. I serve them for dinner with a salad and a really good canned tuna packed in olive oil. (I like American Tuna and Genova Tonno brands). These are also great to serve as appetizers at a party --always a big hit with kids and adults alike. Sour Cream, Avocado, fresh basil or cilantro ---whatever you like as accoutrements! Heat oven to 425 degrees. 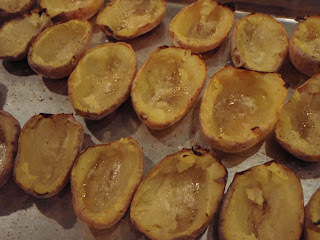 Rinse potatoes under cold water to clean off any dirt. 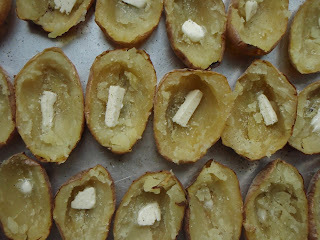 Dry potatoes with paper towels, prick with fork in several places, and place on sheet pan. Roast in oven for about an hour. 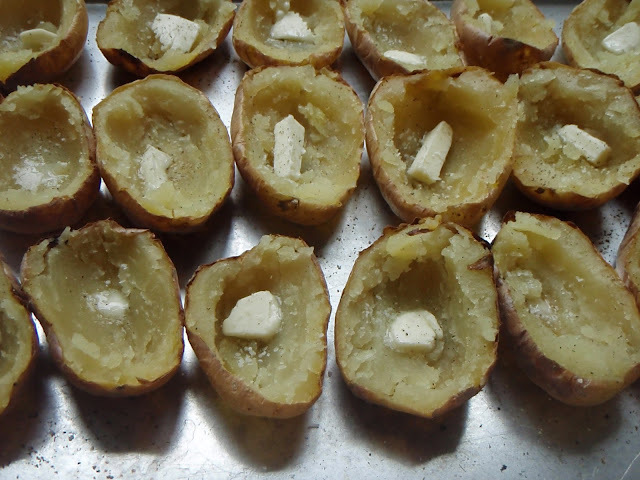 Remove from oven and cut each potato in half. 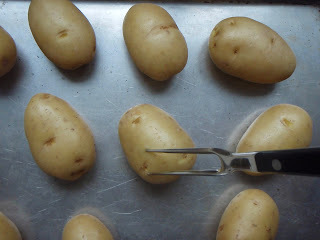 Using a spoon, scoop out the potato leaving about a 1/2 inch of potato border in remaining skin. Add a pinch of butter and salt and pepper to each skin. (At this point the skins can be refrigerated and finished at a later time --even the next day or two). 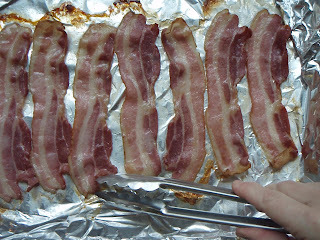 If skins have been refrigerated return to 425 degree oven for 10 minutes, remove and add cheese and bacon. Return to oven for about 5 minutes. If you have not refrigerated the skins just put the butter, salt & pepper, and cheese & bacon into the skins and bake for 10 minutes more. 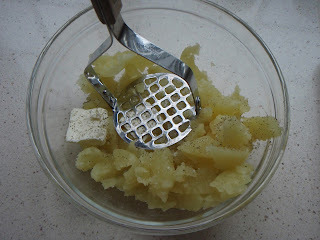 I mash the scooped out potato with a couple tablespoons of unsalted butter and salt and pepper. 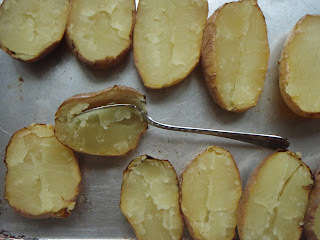 I sometimes mix in some cheddar add these to the potato skins for a "stuffed potato". 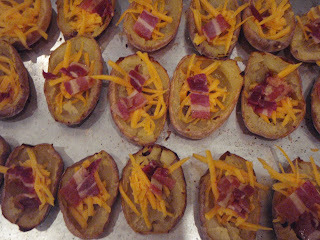 After the first roasting of the whole potatoes I put the bacon into the oven while I am scooping out the potatoes. 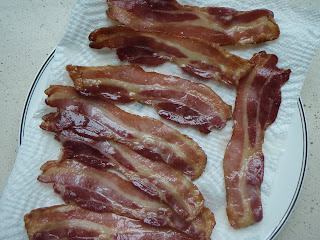 I used a thick-cut organic bacon here. I check after about 10 minutes and turn over. This can also be done in the morning or a day in advance and stored in the refrigerator. Yummy! And you are looking hot in your profile pic! Cha cha cha! You crack me up! Can you believe that Megan took that picture? Thanks so much for following the blog --I am loving all your comments. You are already a great cook so I am thrilled that you using my recipes!